Any reader of this blog will know that many of my duties with vintage buses have moments of drama or unexpected problems. Most of these make the day ‘interesting’ and most problems are soon overcome. Just now and then a job comes along which is completely problem free. My latest job for Crosville was one of these – it went like clockwork throughout. 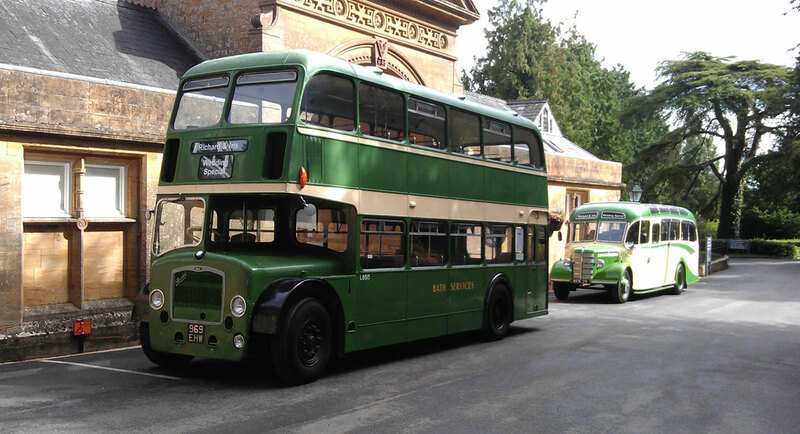 The Work Ticket required me to turn up at Haselbury Mill at 13:20 with Bedford OB coach MFM39 (Crosville SL71). Having had a few problems with fuelling before with this delightful vehicle I was pleased to find that it had been fuelled for me a few days previously. Arriving at the depot in Weston-super-Mare in good time, I had my first sight of the newly expanded garage. Now all the company’s heritage fleet is all together, along with a number of others from the Bristol Omnibus Vehicle Collection. One end of the garage was a sea of Bristol/ECW products! My photo shows just one end of the line-up. With walk round checks complete, I took the 29-seater coach out of the depot and down the A38/M5 towards Taunton. The Art Deco interior had been decorated with bows and ribbons in preparation for this wedding duty. With plenty of time in hand, I was able to enjoy the journey and work on my gearchange technique with the OB’s crash ‘box. Although I’m quite proficient with a Bristol Lodekka, the double de-clutch technique has to be varied to suit the Bedford’s peculiarities. Changing down had previously been a rather clumsy affair, often going into the lower gear with a noticeable crunch. I experimented with the revs and timing to ensure that the gears went in smoothly and, by the time I was driving down the country lane towards Haselbury Mill, things had improved. Although the ‘Seadog‘ Leyland Atlanteans operated by Devon General can be described as ‘iconic’, the ‘Warship‘ open top Bristol VRs that followed them can probably be described as ‘classic’. 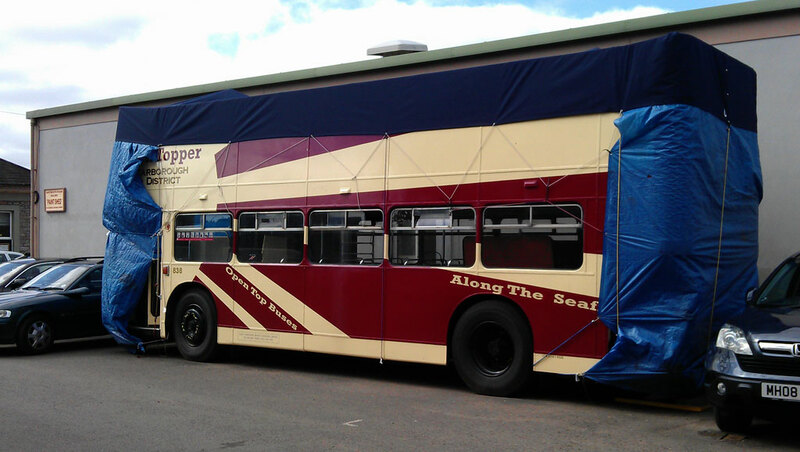 One of them has returned to Devon and is set to re-enter revenue earning service wearing a new livery. I photographed it at Churston not long after it had arrived under suspended tow from Yorkshire. VDV138S was one of the 11-strong batch of convertible Bristol VRTs operated by the NBC (Western National) on South Devon routes. It is shown here on the 124 route to Brixham, leaving Paignton Bus Station. Incidentally, it was the 124 route that I chose to put on the blind of open top Bristol LDL VDV752 when I recreated its layover in Torquay a few years ago. Carrying Devon General fleetnames, 938 ran in service until 1992 and carried the names ‘Warspite’ and ‘Illustrious’ during this period. Rather unflatteringly, it also carried the name ‘Wendy’ during a later period when owned by East Yorkshire Motor Services but the less said about that the better. Coming up to date, Dartmouth Steam Railway has bought 938 from East Yorkshire and, after some remedial work, will run it in service on the 100 route between Torquay-Paignton-Totnes. The Gardner 6LXB engine is currently seized and has been removed from the vehicle. It will be completely rebuilt by one of the Railway’s engineers over the winter period. Other work will be carried out to bring it up to spec, including a repaint into (probably) the same blue and white livery carried by the other two Bristol VRTs in the fleet. It will be very fitting for 938 to return to its old haunts next year, including Paignton Bus Station, on a regular basis. Whether I will be around to drive it is another matter, although the Transport Manager keeps dangling 938 in front of me like a carrot! Although I would love to drive for this operator again next season it is by no means certain as I have to find some other employment in the meantime. It was one of those balmy autumn days when the sunshine still had enough warmth to qualify as an ‘Indian Summer’. I arrived at the Crosville depot in Weston-super-Mare to prepare my allocated bus, ex-Bath Services Bristol LD6G L8515 (969EHW). It was already sitting outside in the sun, along with ‘Bosworth’, the ex-Crosville Bedford OB. A driver colleague, who was on his first heritage private hire job, was already there completing his walk-round checks. Our destination was Dillington House, a large country house near Ilminster, Somerset. As usual, I had researched my route and had written out some bullet-point directions to take with me in the cab just to remind me. I’m glad I printed off a second copy because my colleague, knowing that he would probably be following me, hadn’t checked his map very thoroughly! I gave him my second copy just in case we got separated. Our route took us down the M5 as far as Taunton and then via the A358 towards Ilminster before striking out through the lanes to the venue. We had arrived with time to spare (always a good plan!) so we wandered round a bit, admiring the extensive grounds and impressive frontage to the house. Dillington House has a converted stable block (pictured above) which has additional accommodation as well as function rooms. 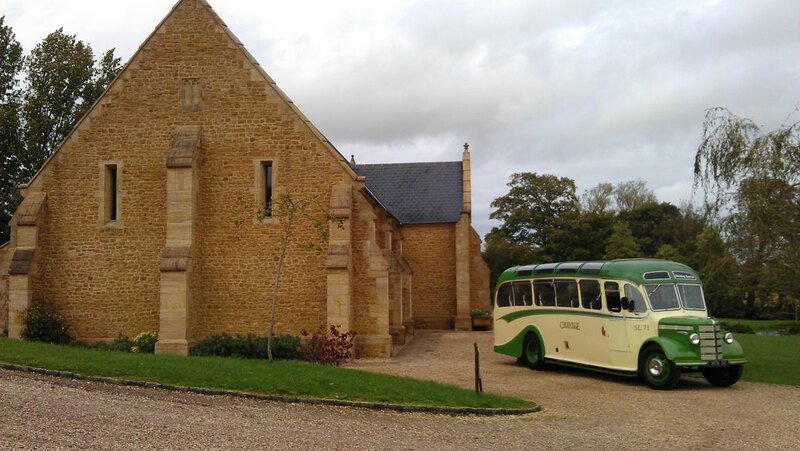 When the wedding guests appeared I was told that the first bus was to take the groom, bridesmaids and ushers to the church first, before returning to collect any guests who hadn’t been able to be seated in the Bedford. So, very lightly loaded, I set off towards the church at Curry Rivel, where the wedding ceremony was to take place. Most of the route was along country lanes so there was much gearbox work to do as I negotiated bends in the road and oncoming traffic. Normally I’m a pretty tolerant kind of guy. Yes, even behind the wheel of a car. But, since I’ve become a local bus driver, I’ve become keenly aware of the things that can easily wind up a bus driver. These devices are brilliant for helping people with limited mobility to get around. But when used incorrectly or inconsiderately they can cause mayhem. I met one recently in Totnes, being driven in the roadway by its owner. There was a pavement nearby (it wasn’t full of pedestrians or hazards) but the driver insisted on travelling in the road, much to my annoyance. Due to the narrowness of the road and oncoming traffic I was unable to overtake the scooter for some time. For the record, I didn’t ‘tailgate’ the scooter nor did I use my horn but I certainly wanted to! I’ve been a cyclist myself but these days prefer to go out into the country and find a dedicated cycleway. But cyclists are entitled to use the road when it is safe to do so and some of them take this freedom to the n-th degree. A few weeks ago I tangled with one particular cyclist on the way from Paignton to Totnes while driving the Service 100 with a Bristol VR. While waiting at traffic lights a cyclist came up on my nearside, dressed in full kit. The lights changed and we both set off across the junction. I intended to pass him before the road ahead got narrow again but he powered away at such a rate that he was still beside my back wheels as the road got narrow. Oncoming traffic forced me towards the nearside and the bus came uncomfortably close to the cyclist. Why couldn’t he have eased off a bit? He could see that there wasn’t going to be enough room for the both of us! I think he was one of those to whom a bus is like a red rag to a bull. Due to further traffic lights and bus stops, we tangled with each other for another three miles and I lost a lot of time on that journey just hanging back waiting for an opportunity to pass the cyclist safely. I encounter cyclists quite often as the route that I take is quite challenging for a cyclist and therefore attracts the keen ones in large numbers. Some days they are the scourge of my life!